/ Modified may 1, 2018 8:56 a.m.
Teachers flooded the state Capitol on Monday for third day of protests. 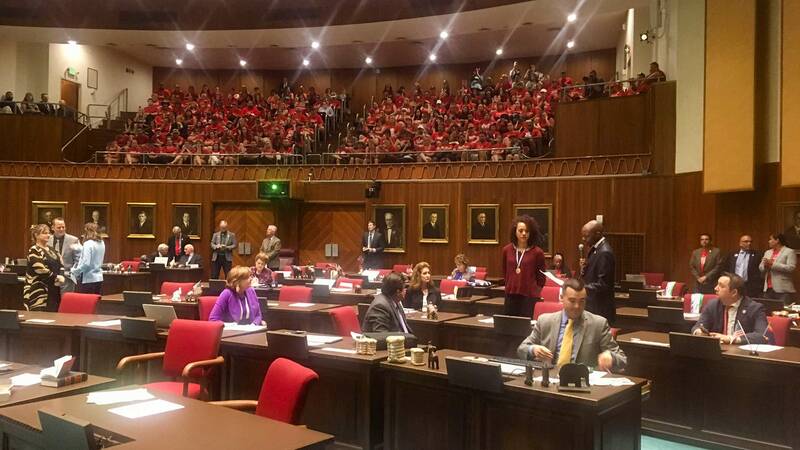 Teachers wearing #RedForEd fill the Arizona House gallery, April 20, 2018. For the third school day, tens of thousands of teachers went to the state Capitol to demand raises and more funding for schools. While the teachers gathered outside, inside, Republican leaders shared a budget plan with lawmakers. The plan includes Gov. Doug Ducey's proposed 19 percent pay raise for teachers over the next three years. But teachers want more than a higher salary. "It is not just teachers, it is all the people who make it work, classroom supplies, support staff, it is the whole package that needs support," said Jay Bertelsen, a teacher at Tortolita Middle School in Pima County. Bertelsen said he would not go to Phoenix every day to protest, instead he will stay in Tucson and take part in activities there. The education budget will get its first committee hearing Tuesday morning in the House and Senate Appropriations committees. House Minority Leader Rep. Rebecca Rios said the budget proposal doesn't do enough to fund education, calling it a "shell game." Legislative leaders say they hope to have the budget finalized and approved by the end of the week.